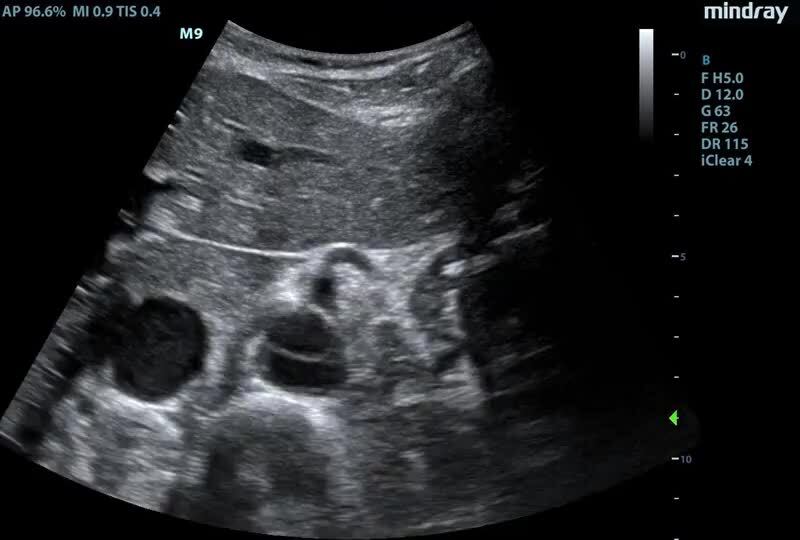 On this bedside trans-abdominal, transverse view of the abdomen, you can visualize the aorta (on the right side of the screen) sitting on top of the spine and the IVC (on the left side of the screen). On this clip – in the lumen of the aorta – you can see an intimal flap that moves with each cardiac beat. This is the typical appearance of an abdominal aortic dissection. According to the Stanford classification, dissections are categorized into Type A or Type B. Type A dissections involve the ascending aorta; Type B, the descending aorta. The mortality associated for aortic dissection involving the ascending aorta has been reported to be between 29-45%.1 Some sources state that the mortality increases by 1-2% an hour, 2 making early diagnosis an important predictor of survival. Hypertension is the main risk factor. Other risk factors include: Ehlers-Danlos, Marfan, Noonan, Turner Syndrome, Osteogenesis Imperfecta, cocaine use, trauma, iatrogenic, etc. Bedside ultrasound for aortic dissection should generally be thought of as a relatively specific, yet insensitive test. To maximize the sensitivity of the scan, the entire aorta should be visualized: the full abdominal aorta in short and long axis, thoracic aorta in long axis from a parasternal view, an arch view from the suprasternal notch, and a view of the aortic root from a parasternal long axis cardiac window. Identification of an intimal flap in the abdominal aorta does not inform the clinician as to the dissection type, so the entire aorta should be imaged to help manage the patient appropriately. Once diagnosed, a CTA is often necessary to guide surgical management. As we do with all our patients, the first step in management would be to stabilize addressing the ABCs, IV/O2/monitor. In this patient with a Type B dissection, it is important to minimize shearing forces on the aorta by controlling the blood pressure and heart rate, generally with goal heart rate of 60-80 bpm. 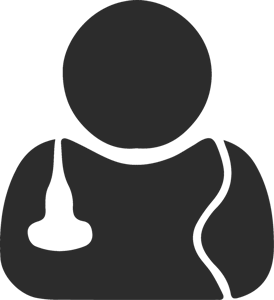 Early involvement of appropriate consultants will maximize the patients chance of survival. In this case, the patient was hypotensive and in tenuous condition. Vascular and Thoracic Surgery were at the bedside quickly and the patient was taken emergently to the operating room. As with all of the cases I’ll share: A big THANK YOU out to the MGH faculty, residents and PAs for obtaining these images and sharing the case. Even more gratitude to the MGH US Division for being openly supportive of ultrasound education and selflessly spreading the ultrasound love! Aldeen, Amer, and Lucas Rosiere. “Focus on: acute aortic dissection.” Imaging. 6 (2009): 4.